Let’s face it, not everyone needs a toy hauler with a patio and there are just some places you cannot get a Class A, Class C, or the majority of travel trailers on the market today. So if that is the case, then you likely have a Truck Camper. We are the go to guys for truck camper accessories. From truck camper tie downs to trailer stabilizers, our friendly staff knows truck camper parts and accessories inside and out. Feel free to call, we can help you figure out anything and everything that has to do with truck campers. From mounting, stake pocket tie downs, hitches, steps and more. The famous TorkLift frame mounted tie downs and TorkLift turnbuckles including the Anchor Guard, Derringer and Fastgun. Happijac tie downs and turnbuckles including the Qwik Load upgrade and the spring loaded turnbuckle set. Order pickup camper tie downs today! Stake Pocket Camper Tie Downs, Receiver Mounted and Frame Mount Tie Downs, Belly Bar Tie Downs, and More Truck Camper Tie downs can be found here. 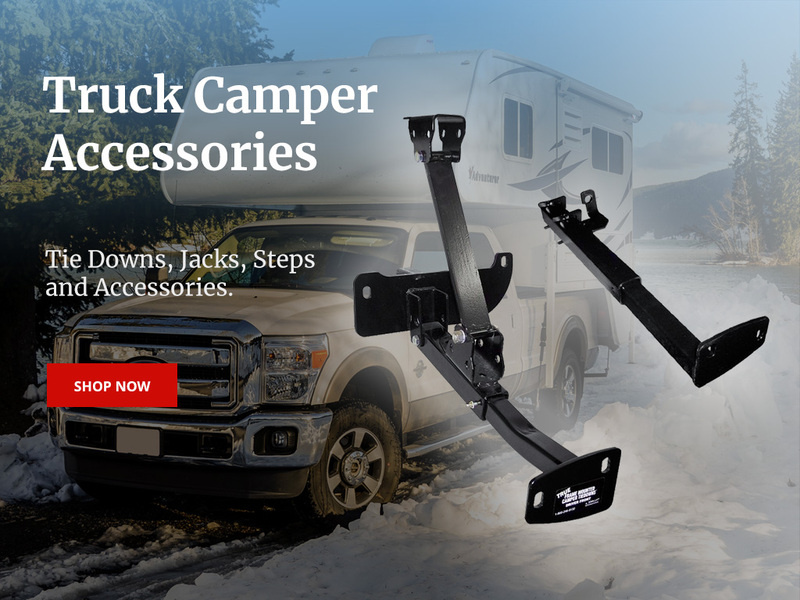 Find truck camper accessories like Truck Camper Jacks, Truck Camper Brackets, Remote Control Systems, Adapters, Parts, Accessories and More. An unbeatable twin beam SuperTruss receiver extension system creates the Highest Rating in the industry! Our Truck Camper Wiring Harnesses are located in this section. Truck to camper, and extension harnesses for your receiver extension. TC steps including the Torklift Glow Step. These truck camper steps will glow in the dark for 10 hours after just 5 minutes of light exposure! When your camper is not in use, protect it with these covers and truck camper accessories!